It's a beautiful and sunny day on the Westcoast. Looks like spring / summer has arrived!! And, of course, the most important thing ... the Canucks and Bruins are playing tonight. GO CANUCKS GO!!!! I actually did two main panels with the same brayering and images, because I wanted to try doing some different backgrounds. Here's my first one ... I'll hopefully post the other later today (after the game!). Hope you like. I brayer the Whisper White cardstock with Tempting Turquoise, Garden Green and Pacific Point. The great thing about putting Pacific Point on top of Garden Green is that it creates a beautiful teal color! 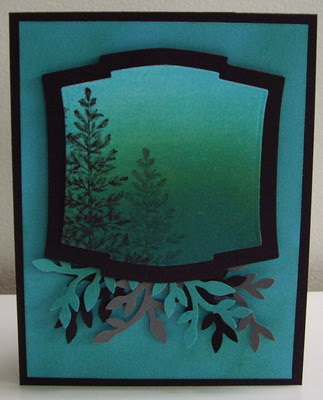 I stamped the Pine tree in Black and then twice more in Gray, offsetting the second and third stampings from the first. 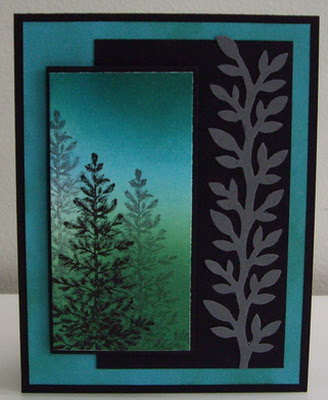 I sponged the Tempting Turquoise cardstock with Garden Green ink to tone done the color of the cardstock and have it match more closely with the brayered image. I punched the vine trim from Basic Gray cardstock and glued it on top of the black panel. I mounted all the pieces as shown in the picture above, popping up the brayered panel with dimensionals. Labels: all occasion, brayering, punch, spellbinders, Stampin' Up!